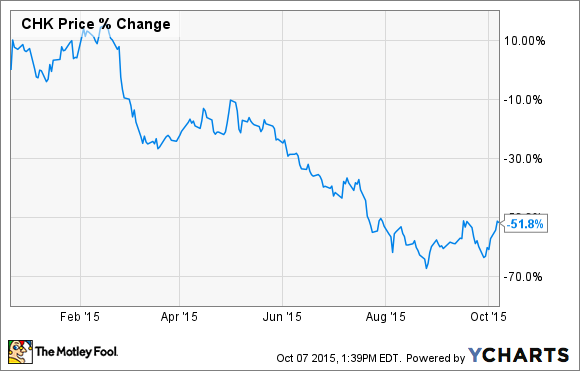 Where Did All of Chesapeake Energy Corporation's Liquidity Go? At the end of last year, Chesapeake Energy Corporation boasted of $9 billion in liquidity, but that number is expected to fall to just $5.5 billion by the end of this year. Upon closing the sale of its Southern Marcellus and Eastern Utica shale assets late last year, Chesapeake Energy Corporation (NYSE:CHK) boasted of having a strong financial position. In fact, in the press release announcing the closing of the deal, CEO Doug Lawler said, "Chesapeake now has a liquidity position of approximately $9 billion." However, as of its most recent investor update, the company expects to end this year with just $5.5 billion in liquidity. While that's still a lot of money, so is the $3.5 billion in liquidity that wasted away over the course of the year. So what happened to all that money? What's worth noting is that the liquidity Chesapeake is referencing is made up of two parts. The first part is its cash on hand, which at the end of last year was $4.1 billion, according to its annual report. The second part of its liquidity is the available capacity on its credit facility, which was undrawn at the end of last year at $4 billion and still remains undrawn. That means liquidity to begin 2015 was only $8.1 billion. That would be quite the rounding error if it wasn't for the fact that the number the CEO referenced included more than just the cash on the balance sheet to end the year and the borrowing capacity on its credit facility. That difference aside, the fact of the matter is that the company's liquidity is evaporating. The main culprit is its cash outflows, which haven't come close to being matched by cash inflows. The crux of the problem is that Chesapeake Energy is expected to spend $3.5 billion-$4 billion on capex this year to both maintain and grow its production. As the following slide notes, the bulk of that spending happened in the first half of the year. Data source: Chesapeake Energy Corporation investor presentation. Furthermore, it had additional cash outflows for common stock dividends, which have since been suspended, and preferred dividends, totaling $450 million on an annual basis. Because of these cash outflows the company was expected to outspend its cash flow by as much as $2.1 billion this year, according to analysts. To bridge that gap, it used the cash on its balance sheet. We see this in the change in the company's cash and net debt position on the following chart. 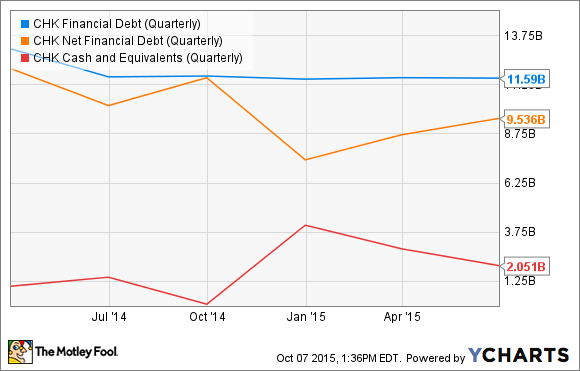 CHK Financial Debt (Quarterly) data by YCharts. As that chart shows, while overall financial debt stayed flat at $11.6 billion, the company's net debt slowly climbed higher as it burned through about half of its nearly $4 billion cash position. Suffice it to say, that was money that was best not spent as it would have only further incinerated the company's liquidity. Chesapeake Energy's liquidity has fallen dramatically over the course of the year. That's largely due to the fact that it has used its cash position to fund a large gap between its cash flow and its cash outflows. The concern is that this is a gap that the company can't fund forever, as it burned through a whole lot more cash than it initially expected this year due to weak commodity prices. As such, it's something investors need to continue to monitor, especially since the company's persistent overspending hasn't created any tangible value for them in recent years.